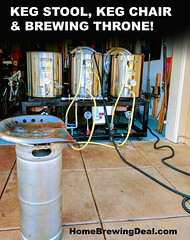 Coupon Description: Score a free wide mouth bubbler home brewing fermenter with this limited time Northern Brewer promo code. Just spend $150 and Get a FREE Big Mouth Fermenter. Click the link for all of the details on this Northern Brewer coupon. Greatfermentations.com Black Friday Promo Code Save $200 On A Grain Father. Coupon Details: Get A Free Carboy With A $125 Purchase and Save $200 On A GrainFather Home Brewing System. GreatFermentations.com Coupon Description: The Black Friday sale at Great Fermentations is now going on! Act now and save $200 on a Grain Father home brewing system and spend $125 and get a free home brewing carboy. 1. Add $125 of qualifying items to your cart. 3. Enter promo code CARBOY18 into the promo code field on the shopping cart page. MoreBeer.com Coupon Code Description: Right now More Beer is running a promotion that will save you 20% on some of their most popular carboys! I am not sure how long this More Beer promo code will last, so if you are looking for a new carboy you might want to act fast! MoreBeer.com Coupon Code Description: When you use the MoreBeer.com promo code BEERDEAL today while supplies last, you will save $6 On A FerMonster 7 Gallon Wide Mouth Plastic Carboy With Spout! The Fermonster home brewing carboy is designed specifically for fermentation. The large lid allows for easy filling and makes hop or oak additions a breeze. The smooth sides aid in sanitizing the carboy since there are no ribs or texture to collect yeast and bacteria. The large 7 gallon size was designed to provide ample space for fermentation and you’ll find the molded in volume markers super handy for accurate filling. The punted bottom allows sediment to collect to the sides so that you can siphon liquid from the center. The home brewing carboy is built from PET plastic making them nearly unbreakable and far safer than glass carboys. PET food grade plastic is the same material used in 2 L soda bottles, which is nearly impermeable to oxygen penetration. Due to the thickness of the material the Fermonster does not require ribs for stability. That results in a super smooth interior surface that reduces yeast and sediment buildup making it the easiest to clean, most sanitary PET home beer brewing carboy on the market. The giant 4″ opening at the top of this homebrew carboy makes filling and cleanup a snap. The 7 gallon volume is a monster of a fermenter, reducing blowoff issues seen with standard 5 and 6 gallon carboys. Fermonsters are easily moved by hand or consider using our Carboy Carrier for even greater ease of use. This is probably the best carboy on the market and today you can save $6 bucks on them and get free shipping on order of $59 or more! Coupon Description: Use the Northern Brewer promo code FERMENTOR and get a free glass home brewing carboy if you order is over $100, just pay for shipping! NorthernBrewer.com has good prices on select homebrewing items, but they rarely beat the prices of either MoreBeer.com and HomebrewSupply.com , especially after expensive shipping costs are factored in. 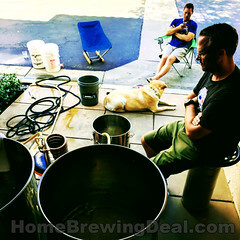 More Beer offers free shipping on your home brewing orders over $59 and has the best customer service in the business! 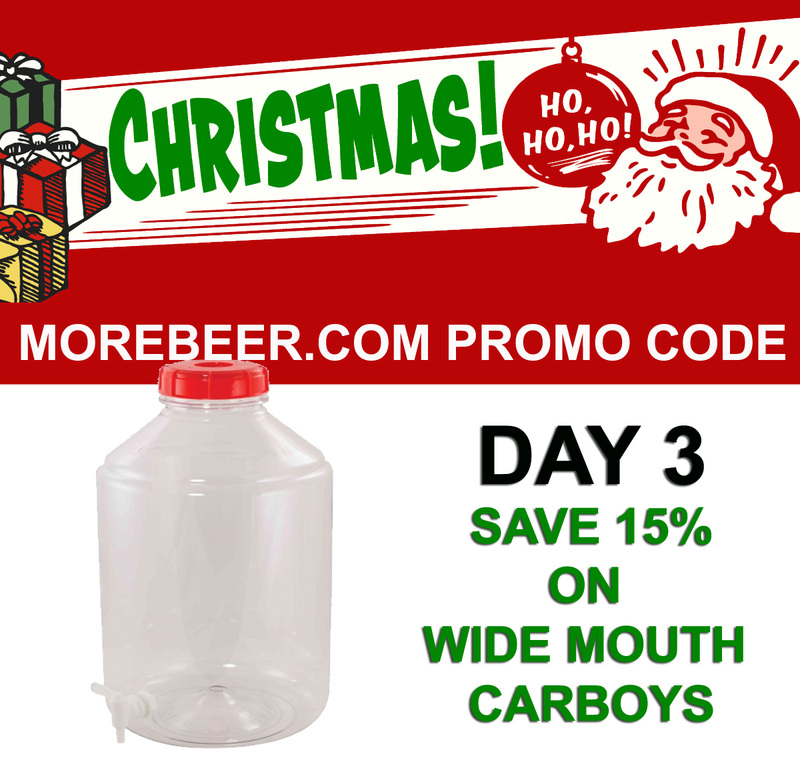 MoreBeer.com Coupon Code Description: Today only at MoreBeer, you can save $5 on every plastic Fermonster Wide Mouth home beer brewing carboy! This includes More Beer’s porter fermonster carboys! Click the link for all of the details and to see all of the eligible carboys for this More Beer Coupon Code. Coupon Code Description: Use MoreBeeer Promo Code BEERDEAL and save $6 on a Fermonster 7 Gallon Plastic Carboy with a Wide Mouth opening and Spigot make bottling and transferring to a keg easier than ever. 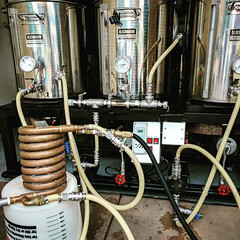 This new version of the Fermonster has been ported with a spigot and has been designed specifically for home beer brewing fermentation. The Fermonster plastic carboys large lid allows for easy filling and makes hop additions quick and easy. The large 7 gallon size was designed to provide extra head space for fermentation. 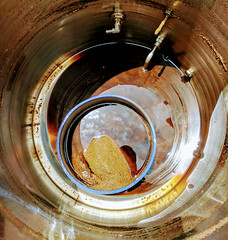 The bottom of the Fermonster is punted allowing trub, old yeast, hop debris and sediment to collect to the sides so that you can siphon clear beer from the center. The Fermonster is constructed from food grade PET plastic and is nearly unbreakable! Since it is plastic, it weights less than glass, has a smaller footprint and is much safer than a glass carboys. Fermentor home brewing carboys are completely air tight and the lids seals tight with an o-ring. Don’t forget, you will get free shipping on orders over $59! Here are some of the specs on the More Beer plastic Fermoster homebrew carboy. Coupon Code Description: Save 15% On Speidel Plastic Home Brewing Fermenters at More Beer, today only while supplies last when you use More Beer promo code Dance at checkout. This More Beer promo code is good on 4 different Speidel plastic homebrew fermenters, click the link for all of the details. Even better, these items ship free on orders of $59+ at More Beer! 4″ wide mouth carboy – easy to clean!